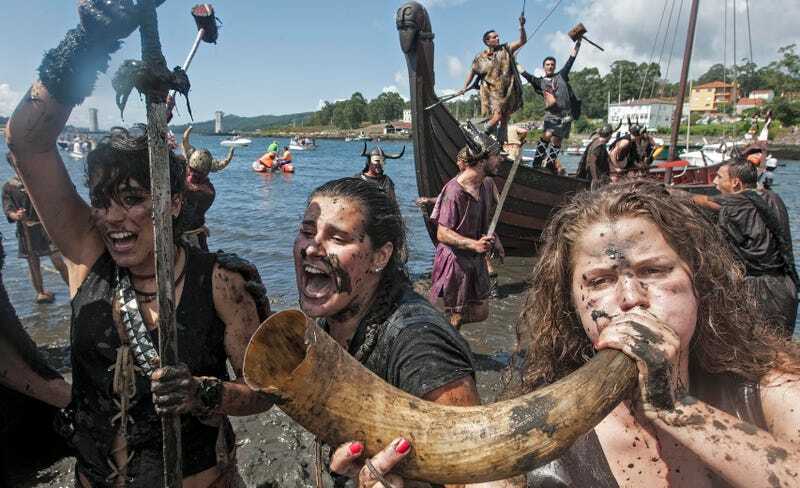 A study published last week in the American Journal of Physical Anthropology reports that a DNA analysis of bones interred in a grave assumed to belong to a Viking warrior found that the human remains, first excavated in the 19th century, were those of a woman. The research strongly suggests that the woman was a not only a warrior, but a high-ranking, wealthy one, as she was buried in a grave filled with arrowheads, swords, and a couple of sacrificed horses. As National Geographic notes, there are scattered throughout Viking mythology several hints at the existence of female warriors. The 13th-century Saga of Volsungs, for instance, discusses “shield-maidens” who fought alongside men, and a 10th-century text tells the story of Inghen Ruaidh, the “Red Girl,” who commanded a Viking fleet that sailed to Ireland. Becky Gowland, a lecturer on archeology at Durham University, told The Guardian that presuming the a degraded body’s gender is an error archeologists make all too often: “Because it was buried with weapons, [people assumed] it must be a man. I think that’s a mistake the archeologists make quite often. When we do that, we’re just reproducing the past.” If true, this suggests there could be more hard scientific evidence of female Viking warriors that has been overlooked and undermined by modern-day sexism. And, speaking of modern-day sexism, it may not be highly evolved, but it sure is thriving.